During the Summer STEM Camp hosted by Bumpers College's departments of animal science, food science and horticulture, food science professors warned campers about dangers associated with liquid nitrogen and Dragon's Breath frozen desserts. FAYETTEVILLE, Ark. – A growing trend of dipping frozen deserts in liquid nitrogen shortly before serving poses several potential health risks, according to food science and food safety professors at the University of Arkansas. Treats made by dipping food items in liquid nitrogen immediately before serving produce extremely cold vapors. When placed in the mouth, those nitrogen vapors can come out of the nose and mouth. Liquid nitrogen is extremely cold. It hits its boiling point at -324 degrees and changes from a liquid to a gas. This transformation produces possible health risks, including internal and external burns, and internal complications when the gas expands in the stomach. Wang and Sun-Ok Lee, professor of nutrition, are both faculty members in the U of A’s Dale Bumpers College of Agricultural, Food and Life Sciences, the Department of Food Science and with the U of A System Division of Agriculture. 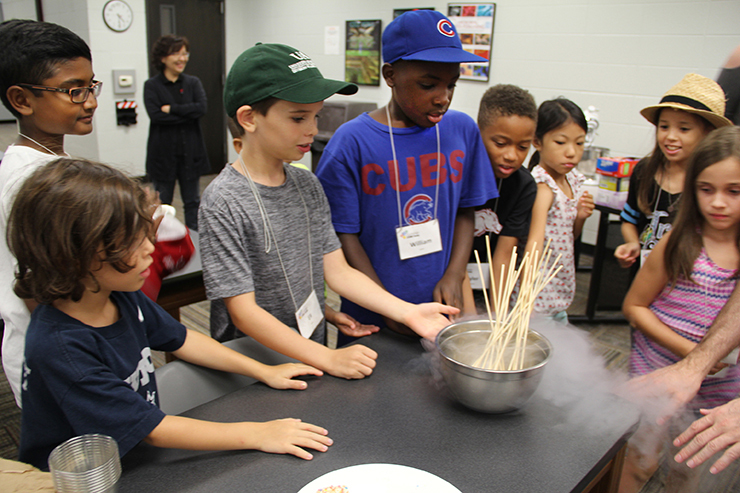 They recently discussed potential hazards of consuming food dipped in liquid nitrogen with elementary school children visiting campus as part of the Summer STEM Camp. Be cautious because liquid nitrogen is colorless, tasteless and odorless. The extremely cold temperature can burn and damage human tissue. Make sure all liquid nitrogen is evaporated. A safer liquid nitrogen dessert alternative is ice cream because there’s more time for evaporation of the nitrogen. For more information on food science, food safety and food science STEM camps or departmental tours, please email student relations coordinator Rosa Buescher at rosab@uark.edu.